This option would be used when the family changes their mind about attending before the student begins class. The parent can drop the student but if for some reason, the parent does not perform the drop of the class, the Summer School staff can do this as well. This will credit the student’s account balance. From the Students screen, locate the student and click the ( ) icon. Click the Drop button next to the course that needs to be dropped. 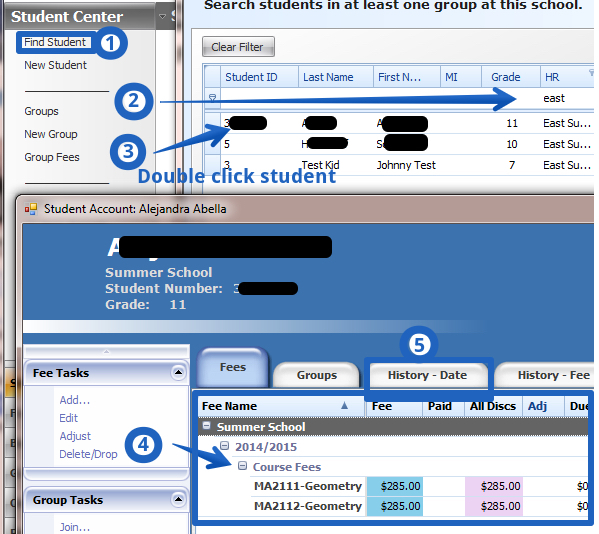 A data sync runs between Summer School Registration and Rycor every 30 minutes. When this process runs, the student’s account will be credited. If the family did not pay for the course, then the amount is simply removed from the student’s account balance. If the family paid but there is an open balance for Summer School or regular registration fees, the amount that had been paid towards the course will be reassessed to pay the student’s remaining account balance. If the family paid and otherwise had no balance owed to the district, the Business Office will issue a refund. The Business Office regularly reviews Rycor for families owed refunds and returns funds via credit card when possible or writes refund checks when needed. Please direct questions about refund timing to the Business Office. This option would be used when a student stops attending a course but should still be charged. This will remove the student from the PowerSchool roster when then next sync occurs but will not trigger a credit on the student’s account. Click the No Refund button next to the course that needs to be dropped. The next time the Enrollment Import for PS is imported, the student course enrollment will drop from Summer PowerSchool. This will have no effect on billing and the student will still owe the district for this course whether or not they have already paid.